In 2015, the United Nations Secretary-General established a High-level Panel on the Global Response to Health Crises to consider the lessons learned from the outbreak of Ebola in West Africa and to make recommendations to strengthen the capacity of the international community to respond to future health crises. This guest editorial considers the recommendations of the High-level Panel in relation to the role of the International Health Regulations in providing a framework for the global control of communicable diseases, the complex issue of building capacity within national health systems, recommendations for a re-positioning of the role of the World Health Organization, regional and global responses to health emergencies, the funding of global health emergency preparedness and response, and the role of gender in global health governance. Various forms of restraint may be used in a variety of health care settings to control behaviour. Laws and policies regulate the use of physical and mechanical restraint across health care settings, but there is a gap in relation to the regulation of chemical restraint. This may partly be because of problems in defining the term and partly because of a lack of information as to the extent of the use of drugs aimed at controlling behaviour rather than ameliorating a medical condition. This column provides an overview of current definitions and argues that there is a need for national guidance as to what constitutes chemical restraint in order to reduce its use. For many years, solitary confinement has been a contentious correctional intervention. This column explores the evidence that solitary confinement harms mental health, and reviews some of the international and local perspectives on the practice. Recommendations are made to end solitary confinement, contending that this is to the benefit of prisoners and prisons, as well as the communities to which prisoners will return. Solitary confinement is increasingly subject to opprobrium from health professionals and representative organisations, as well as being the subject of more rigorous recommendations in international instruments. The column proposes greater involvement of mental health professionals, systemic research to reduce solitary confinement, and programs of external review and scrutiny. Such measures are consistent with international instruments and would bring Australia into line with contemporary thinking about conditions of incarceration. This column examines recommendations from the Harper Competition Policy Review relating to the opening up to corporate ownership of the community pharmacy sector in Australia. After studying the outcomes of similar proposals in other nations, it examines whether s 51(xxiiiA) of the Australian Constitution provides a prohibition against such a reduction of the small business option for those pharmacists wishing to develop a pharmacy business in Australia. An analysis of the services provided by community pharmacists finds that services such as the provision of advice on the safe and efficacious use of medicine, the prescribing and administering of vaccinations, the treatment of minor wounds and ailments, the provision of pharmacist-only medicines, and diabetes education all form part of the core function of community pharmacists. Given that these services are fundamentally medical in nature, community pharmacists as Commonwealth-regulated medical service providers for the purposes of s 51(xxiiiA) are thereby protected against Commonwealth policy or legislation facilitating civil conscription. 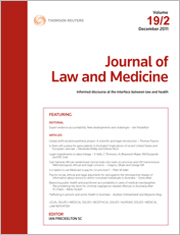 This article reviews a series of high-profile decisions made during 2016 by the Western Australian Family Court in relation to a child with a brain tumour whose parents were resistant to his being treated with chemotherapy and radiotherapy by reason of their commitment to natural therapies and their belief at an early stage after his diagnosis that orthodox medical treatment should be abandoned in favour of palliative care. The article argues that the decisions in Director Clinical Services, Child & Adolescent Health Services v Kiszko  FCWA 19, 34 and 75 constitute a problematic precedent in terms of the potential for certain forms of parental behaviour being able to engineer a desired outcome that may not be in the best interests of a vulnerable child. It contends that efforts should be made to hear the voice of a child in such cases, that it is important that collateral agendas which may be influencing antagonism to treatment be identified early, and that a constructive role may be able to be played by child protection authorities in prompt initiation of litigation where attempts at non-adversarial resolution of a treatment impasse have failed. Tangible research materials and data sets are integral to biomedical research and diagnostic genetic testing. Patents over genes and other research tools have been blamed for restricting access to these tools, potentially slowing the pace of biomedical research and reducing availability of diagnostic genetic testing options. Given that many of these patents are expiring or being invalidated by the courts, this article suggests that attention should now be focused on how the materials and data themselves might be used where access is blocked. Access is critical to the effective conduct of future biomedical research and clinical practice, yet the availability of legal causes of action to facilitate this has not previously been analysed. This article explores possible legal mechanisms and concludes that the outlook for compelling access in the absence of patents is pessimistic. Paradoxically, patents may actually provide a mechanism to gain access to these critical tools, rather than constituting a hindrance. Globally, genomic research is generating unprecedented advances in the understanding of the biology, pathogenetic mechanisms and prognostic markers of many cancers and is creating the possibility of precision (personalised) therapies. As more data are generated, it becomes increasingly necessary to determine the clinical significance of this data and to know when this data should be acted upon. The return of individual research results (IRRs) and incidental findings (IFs) from genomic research, in a well-informed and applicable manner, is becoming increasingly important and is already presenting practical challenges in Australian genetics clinics and familial clinics. This article argues for the need to develop an evidence-based approach to help frame ethical-legal responses to address these tensions – one that may offer flexible and defensible parameters to inform the management of disclosure of IRRs and IFs, safeguarding the health and wellbeing of tissue donors and allowing translational biobank genomic research to flourish. This article addresses how open access to DNA, RNA and amino acid sequences might be reconciled with the benefit-sharing obligations under the United Nations’ Convention on Biological Diversity and its Nagoya Protocol, the Food and Agriculture Organization of the United Nations’ International Treaty on Plant Genetic Resources for Food and Agriculture, and the World Health Organization’s Pandemic Influenza Preparedness Framework for the Sharing of Influenza Viruses and Access to Vaccines and Other Benefits. Tracing the evolution of open access databases, the article posits models for reconciling open access and benefit sharing; the article concludes, however, that none of the proposed solutions – monitoring and tracing, the contract model, and the copyright and database right model – provides a perfect solution. Each model does, however, suggest that open access to these sequences might be at least partially reconciled with benefit sharing. “Special” or “expanded” access schemes permit the use, outside of clinical trials, of drugs or devices that have not yet been licensed or approved for marketing in a particular jurisdiction. Special access raises important and difficult questions, reflecting tensions between competing interests and values. This article explores similarities and differences between special access schemes in the United States, Canada, and Australia, focusing on areas closely connected with the controversies highlighted in the literature and where the comparison can provide insights for regulatory reform. These jurisdictions differ particularly with respect to how the regulations can be used to protect clinical trials and product development processes, whose authorisation is needed for special access use, and how ethical concerns, such as informed consent, are addressed. The requirements for data collection and reporting are similar, with all three countries appearing to be uncertain about the utility of information collected from special access use. The creation of a criminal offence for non-consensual genetic testing in Australia has been recommended repeatedly in recent years, but has not yet resulted in reform. The increasing affordability and accessibility of genome-wide analysis amplifies the potential harm that unauthorised testing could cause to individuals. The familial nature of genomic information means that there is also potential for serious harm to an individual’s relatives or community, such that harm can result even when the individual whose sample is being tested is deceased. In preventing such harms, it is important not to unduly restrict clinical, research and forensic applications that will result in considerable benefits and can better be regulated through alternative means. For these reasons, an offence of non-consensual genetic testing should be introduced and expanded to include samples from deceased persons, subject to appropriate exceptions. Although therapeutic medicines are frequently prescribed to improve health, individual responses are often inconsistent, unpredictable and potentially harmful. Recognising that individual genetic variation can influence response, pharmacogenomics aims to identify clinically relevant medicine/genome relationships, and use this knowledge to improve the safe and effective use of medicines. To facilitate the translation of new pharmacogenomic knowledge from the scientific laboratories where it is generated, into the clinical health services where it can be applied, Khoury et al developed a framework outlining a continuum of translation research. This framework must be embedded within a social and political environment conducive to supporting translational research if the desired outcomes are to be achieved. Drawing on the example of one pharmacogenomic test that is now well integrated into clinical practice, this article traces the contemporaneous social and political factors that facilitated translational pharmacogenomic research, and enabled the safe use of a vital medicine. This article examines issues of ethics, science and law in the context of a recent High Court decision involving an application by Yvonne D’Arcy to revoke patents granted to Myriad Genetics Inc for various genetic sequences found in the BRCA1 gene once isolated (which, when certain mutations were present, had been found to be linked to the occurrence of breast and ovarian cancer). This article provides a brief discussion on the history of patent law and an extensive discussion of the requirements under s 18(1) of the Patents Act 1990 (Cth) for the granting of a patent involving the use of human genetic material. Prenatal screening and its technological counterpart, prenatal diagnosis (PND), have been the subject of extensive debate since their inception, particularly given PND’s inextricable links with abortion. Despite this, prenatal screening policy and practice has evolved over the last few decades and is now well established. However, a new permutation of prenatal testing, first performed in 2011 and subject to rapid commercialisation, potentially heralds a new era. This article provides an introduction to non-invasive prenatal testing and outlines some of the ethical and legal issues associated with the early clinical integration of this rapidly evolving technology. This article examines the clinical and legal risks of early medical abortion. After providing an overview of the history of mifepristone in Australia, the evidence concerning the efficacy and safety of medical abortion is discussed. It is argued that the negligible medical risks associated with mifepristone do not justify the restrictive regulatory measures imposed on medical practitioners. The article then turns to the legal risks and considers whether medical practitioners are vulnerable to prosecution under existing State and Territory laws. It is argued that providing early medical abortion services in a number of jurisdictions is legally ambiguous, potentially posing a threat of prosecution to medical practitioners. The need for law reform is evident by the fact that in four jurisdictions it remains in the criminal statutes, creating legal uncertainty for both medical practitioners and women. The article concludes that there is sufficient evidence to allow some “demedicalisation” of medical abortion. However, this is only possible if the legal status of abortion in State and Territory laws is addressed. Established under New Zealand’s Health Practitioners Competence Assurance Act 2003 in 2014, the Health Practitioners Disciplinary Tribunal (HPDT) hears and determines charges in relation to 21 health professions. Using publically available information, an exploratory descriptive analysis was conducted of 288 published HPDT decisions between 2004 and 2014 to assess the procedural factors (practitioner and hearing characteristics) and outcome factors (findings, penalties and appeals) relevant to these decisions. In particular, the study compared the two health practitioner groups (medical practitioners and nurses) with the highest number of decisions. The study found that nurses were significantly less likely to have legal representation or to lodge an appeal than medical practitioners, with nurses also more likely not to attend the hearing, have their registration cancelled and not receive permanent suppression. The study also revealed important characteristics of the decisions that are not contained in the summaries available on the HPDT website. These characteristics provide opportunities for future comparison across and within occupational groups. While relevant to health practitioners, lawyers, professional bodies, employers, educators and policy-makers, the findings also contribute to the international scholarship on professional discipline and tribunal decision-making. Both New Zealand and Australia have enacted legislation which confers confidentiality on quality assurance activities undertaken by health providers. The statutory privilege is well utilised in New Zealand with over 40 organisations carrying out quality assurance activities under its provisions at any time. The article compares and contrasts statutory privilege in New Zealand with two Australian States (New South Wales and Victoria). It analyses notices issued under the legislation in New Zealand. The use of statutory privilege to review adverse events and systemic issues is considered. Public access to information about quality assurance activities conducted under statutory privilege is examined together with the impact on communication with patients and their families. For the PDF version of the table of contents, click here: JLM Vol 24 No 1 Contents.